Every day, many people around the world are prevented from living their lives due to back pain. Facet joint pain occurs between two vertebrae in the spine and can cause pain that interferes in your ability to live your life to its fullest. If you suffer from this type of pain, there are many different facet joint pain treatments that may give you relief. Conservative treatment for facet joint syndrome will often start with physical therapy. A skilled PT can teach you exercises to relieve pressure from your facet joint pain. Continued exercise can be used to strengthen and train your core and back. Proper exercises can also help straighten your posture. Your PT will help you evaluate and adjust your daily activities. They may recommended that you shorten your commute, take breaks to stretch or rest throughout the day, or practice proper techniques for lifting and carrying heavy objects. Medications are also a part of a conservative approach to treatment and used in conjunction with physical therapy. Anti-inflammatories such as NSAIDs are often recommended before physical therapy appointments to reduce pain, inflammation and recovery time. If anti-inflammatory medications such as Ibuprofen are not successful, your doctor may prescribe a muscle relaxer. Muscle relaxers can reduce pain and are also used to treat muscle spasms. A short term solution may include narcotics if over-the-counter medications and muscle relaxers are unsuccessful. Narcotics can only be obtained with a prescription and typically, do not help with chronic pain. 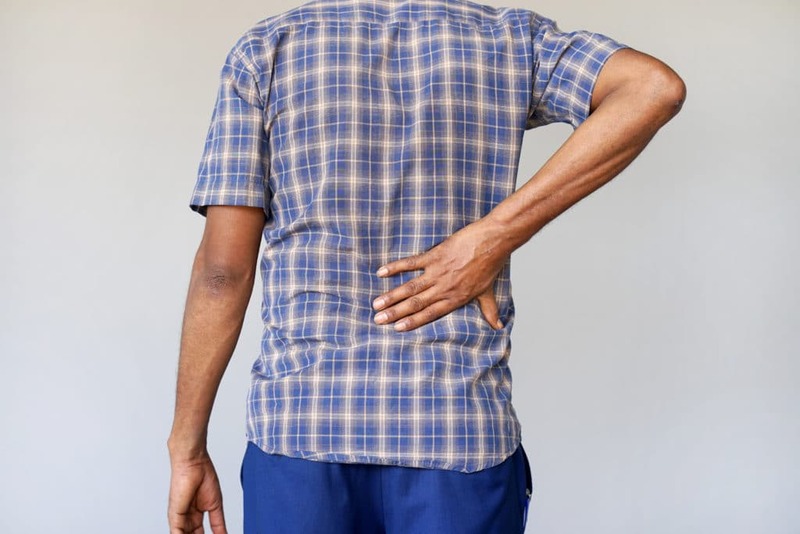 They are used for back pain as a short term solution and if you are taking narcotics, you should be monitored by your doctor. If initial conservative treatments fail, your doctor may recommend injections. A local anesthetic can be injected into your joints along the vertebrae to alleviate your pain. A medical staff will use X-rays to ensure the injection is placed correctly. There may be an initial stinging pain during the application of the numbing agent and there are some risks associated with the procedure such as bleeding, nerve damage and allergic reactions. Radiofrequency ablations are commonly used to help back, neck and joint pain. Your doctor will use radio waves to generate an electrical current and heat up your nerve tissue. By heating up the tissue, the pain signals will decrease in that area of your body. Radiofrequency ablation can provide relief to a patient anywhere from six months to several years. This type of treatment has seen some measure of success in a high percent of patients and is generally safe with minimal side effects. If you receive radiofrequency ablation, you may experience bruising, pain at the site and general discomfort. This type of treatment is not appropriate for everyone and you should always consult with your physician before undertaking any new approach to pain management. A physician will typically use a live feed X-ray to guide the needle to the affected joint. Once the needle is in place, an anti inflammatory, such as a steroid is then injected into the joint. Initial relief can be felt from the local anesthetic used but the steroid will not take effect for several days. These injections can last anywhere from a couple days to a couple months. A rhizotomy is a more invasive treatment option. It is a surgical procedure in which the doctor severs the nerve roots in the spinal cord. By disabling the nerve at the joint, your doctor effectively disconnects the nerve from the pain signals. A rhizotomy can give chronic pain sufferers relief. Because a rhizotomy is a surgical procedure, you will need to consult with your doctor regarding what you can eat and when to stop eating prior to your surgery. You should also review the medications you are taking with your doctor. As with most surgical procedures, your doctor will likely use an anesthetic and should make arrangements for someone to drive you home. At the beginning of the procedure, an anesthetic and/or sedative will be given. Then, your doctor will use a real time X-ray to guide an electrode to the correct placement. The electrode is then used to heat and disable the appropriate nerve roots. After the procedure, you may experience mild discomfort such as pain or soreness. A spinal fusion surgery is one of the most invasive treatment options. Your doctor will place a bone like material, either a bone graft or a synthetic material, between two of your vertebrae so that the bones heal together as a unit. Because this procedure is more invasive, you will be put under anesthesia for the procedure and your physician will make an incision so that they can access your bones. The material will then be placed between your vertebrae and held in place with rods and screws. You will need to stay in the hospital for several days after the procedure to recuperate. This type of surgery is generally recommended only after more conservative treatments have been unsuccessful. If you suffer from facet joint pain, there is a wide array of treatment options available. Call our office and let our experienced staff help you review your options and assist you in choosing the best method to alleviate your pain.